The world’s first casual multi-player puzzle game! Battle against players from around the world and compete against each other for top prizes. Earn trophies to advance through the global leaderboards and become, literally, the Best Fiend! Discover the beautiful world of Minutia like you’ve never seen it before! Travel from village to village showing off your puzzle prowess. Can you make it to the City of Fiends? Play gorgeous never before seen levels and make exciting discoveries along the way! Collect dozens of fiendtastic characters with unique powers, build a team and level them up. Unlock huge rewards by playing in daily events and start or join a team with your friends for even more fun! Compete with other players and defeat Rivals from around the world. 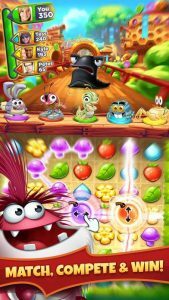 Solve 100’s of never before seen Best Fiends puzzles and compete for trophies. Win chests and unlock huge rewards. Collect and discover dozens of Fiends. Play daily events and special tournaments. There’s a new challenge every day! Progress through the world of Minutia and get to the City of Fiends, where only the best of the best can compete! Start or join team and become the best locally and globally while getting rewarded for sharing cards, winning team prizes and more! Be part of the Best Fiends community and discover original Best Fiends content including feature quality animated shorts.